Wife of Kebbi State Governor, Dr. Zainab Shinkafi Bagudu has warned the general public against association with fraudulent individuals who have created fake social media accounts with her details in order to extort money from people with promises of government jobs. 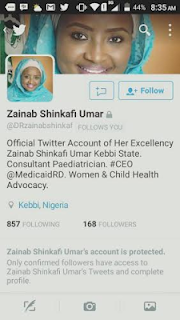 According to her, "It has been brought to our attention that some fraudulent people have opened a fake Twitter account in using details of Dr Zainab Bagudu. 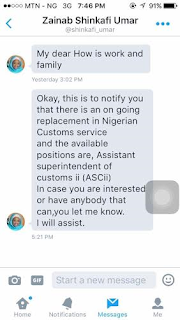 They are trying to extort money from people and promising customs jobs. Please note this is totally false. The official handle is @drzsb and this FB page which is public. A LinkedIn account in her name is also fake. Beware and do not fall prey to these unscrupulous people."